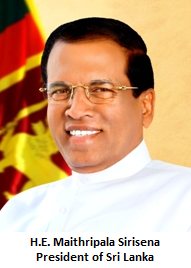 On the invitation of President Moon Jae-in, the President of Sri Lanka Maithripala Sirisena will undertake a state visit to the Republic of Korea from 28 to 30 November 2017, in conjunction with the 40th anniversary of the establishment of diplomatic relations between Sri Lanka and the Republic of Korea. On 29 November, President Moon is scheduled to meet President Sirisena for summit talks, and host the Sri Lankan President to a state dinner. The two Heads of State will discuss matters of mutual interest to deepen cooperation between Sri Lanka and the Republic of Korea. Agreements on Economic Cooperation, Economic Development Cooperation Fund (EDCF) and cultural cooperation, as well as MOUs on investment cooperation and the Employment Permit System (EPS) are to be signed between the two Governments during the visit. President Sirisena is also scheduled to attend a business luncheon co-hosted by the four major Korean Business Associations, and meet with the Sri Lankan community in the Republic of Korea.